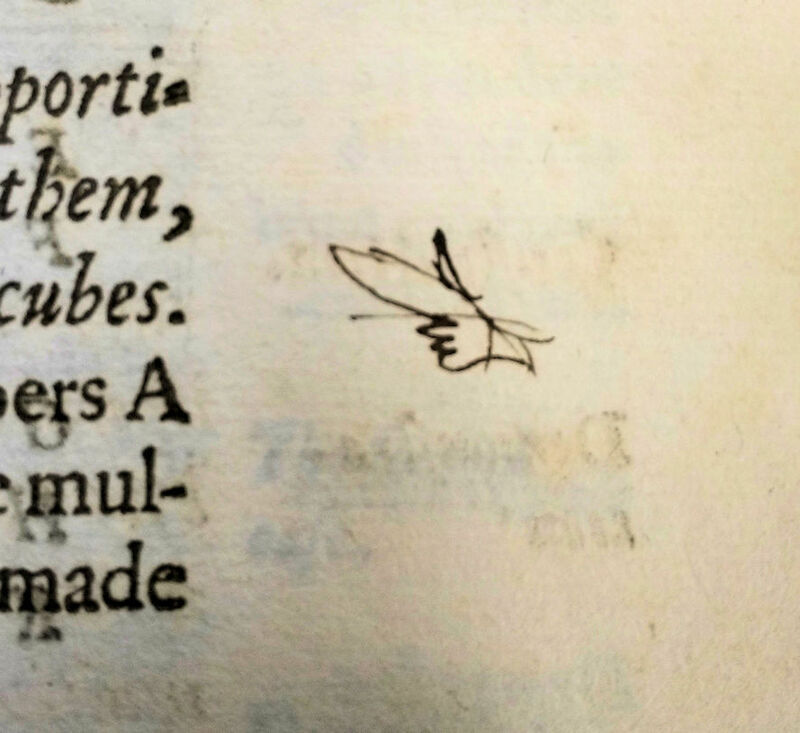 “Marginalia”, or marginal notes, are marks made in the margins of books. 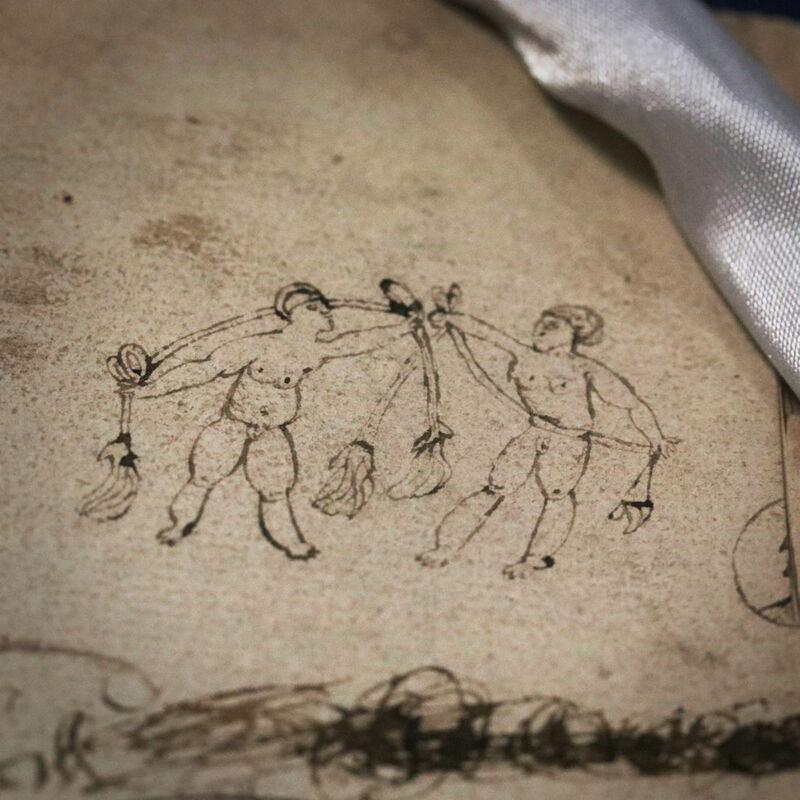 In particular, researchers have become increasingly interested in the marks made by previous owners of a book. Whether these appear as comments, abbreviations, glosses, scribbles, symbols, or doodles, these marks offer an opportunity to better understand the different ways in which individuals have interacted with the book through the course of its life. The passages a reader has chosen to mark can reveal much about the concerns of that individual, and the ways in which they read, as well as about the social, political and religious circumstances in which they lived. “Readers’ marks are better at providing examples (and still better at providing counterexamples) than general rules; but if we cast our net widely they can reveal both large-scale patterns of use and extraordinary encounters of individuals and their books. The former can correct some of our most deep-seated assumptions about reading and readers…” (Used books, p. xvi). 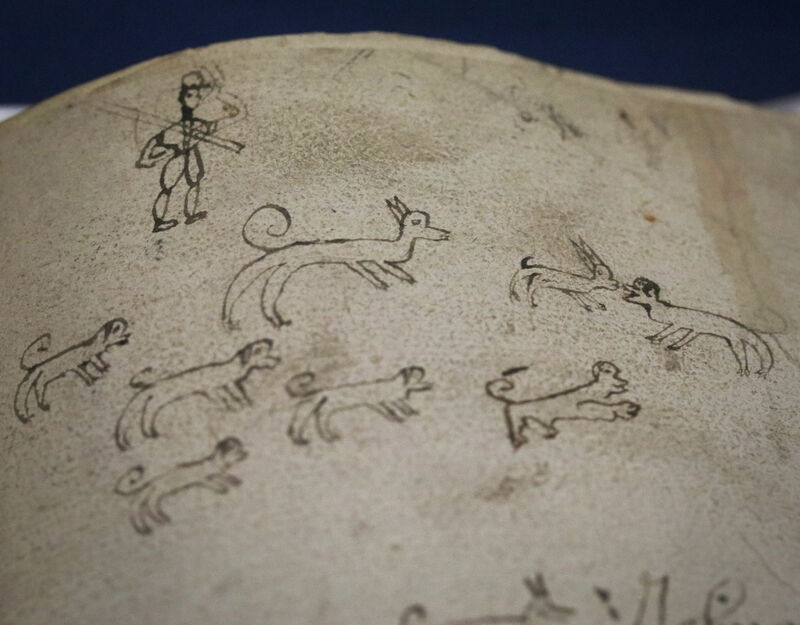 Pictoral marginalia in one of our incunables – Higden’s “Polychronicon”, printed by Caxton in 1482. 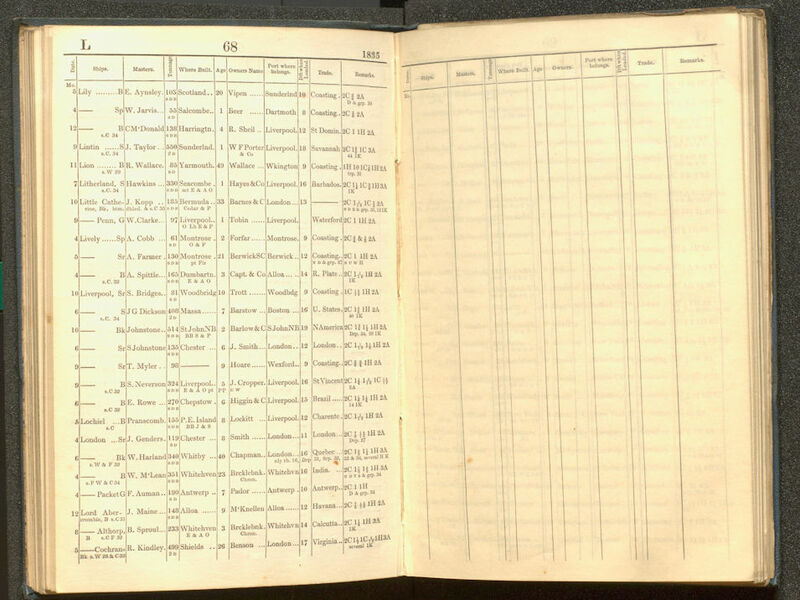 This book boasts the ownership marks of five different former owners (SPEC Inc CSJ D3). 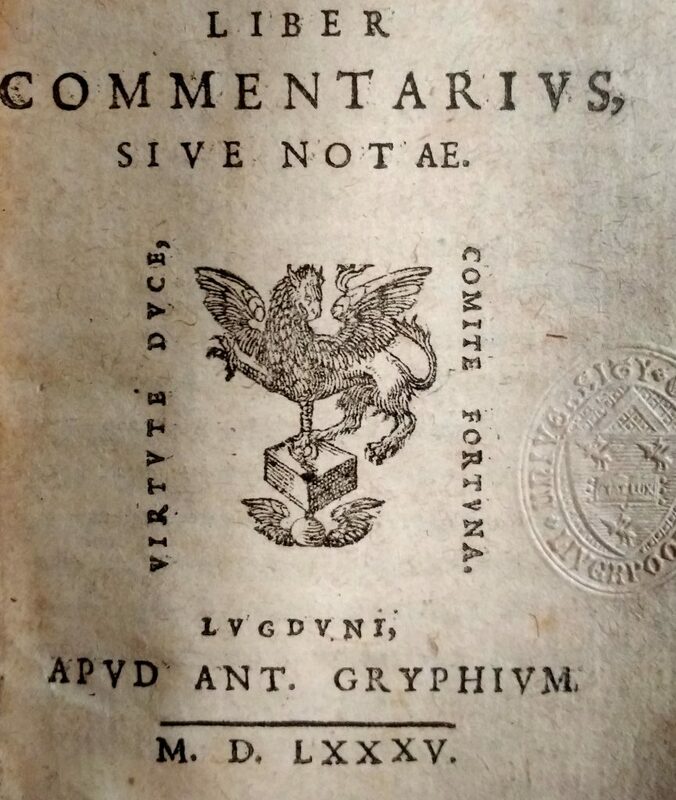 Sherman’s own study of over 1000 books from the first two centuries of printing has helped to shed light on the ways in which many Renaissance readers used writing – or even drawing – in the margins as a means to aid the memory. For these readers, reading was very much intended to be purposeful, equipping a reader for success in work and in society. Today we might feel we can rely upon near constant access to the internet to provide us with information at the point of need, but for previous generations it was important that readers were able to memorise, or quickly access the information learnt through reading. Engaging the hand in note-taking, or drawing, is thought to have helped to help concentrate the mind and strengthen the learning process, enabling readers to commit passages to memory, as well as ensuring the most important passages could be quickly returned to when needed. Renaissance readers often employed a range of symbols to help categorise and arrange the texts they read. One of the most frequently recurring of these is the pointing hand, or “manicule”. Marginal notes can also be used to comment upon, criticise or explain the main text, and as such offer a means by which to trace the reception of specific works and ideas. In a recent Bonnier Lecture given at the University of Liverpool, Professor John O’Brien of Durham University showed how attending to the marginalia left by ‘ordinary’ early modern readers of Montaigne’s Essais, led to unexpected deductions about the ways in which they interpreted Montaigne, and the passages they found to be of most interest. As he noted, these findings can, in turn, help to us to see more current perspective (and its attendant biases) in a new light. 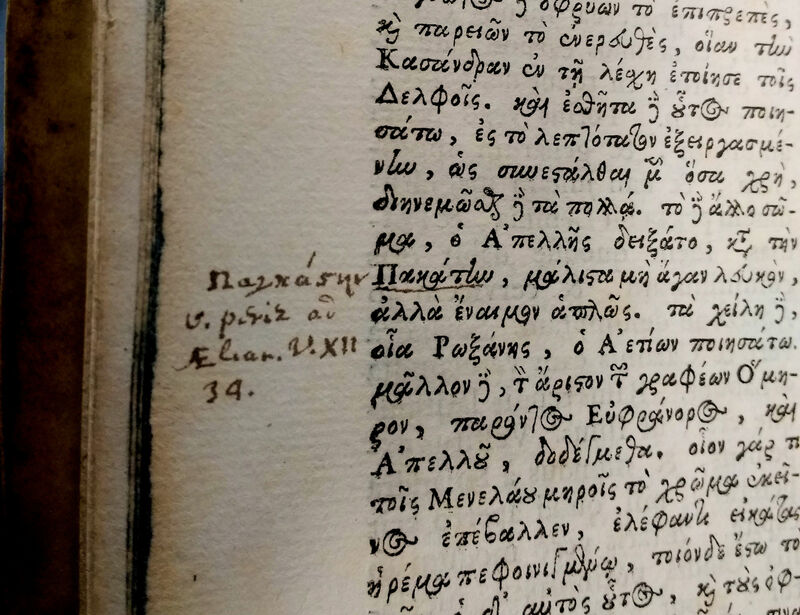 This 1687 copy of the works of Lucian of Samosata contains commentary and cross-references in the margins in more than one language, in a rather neat contemporary hand (SPEC Y68.2.44). 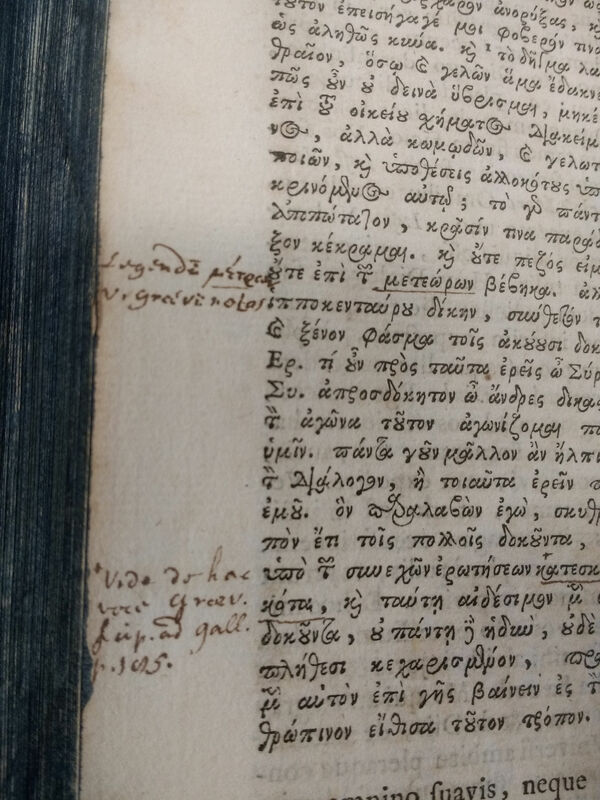 Marginalia offer a rich resource for researchers then, as well as providing an often touching insight into the life and mind of individuals living hundreds of years ago. 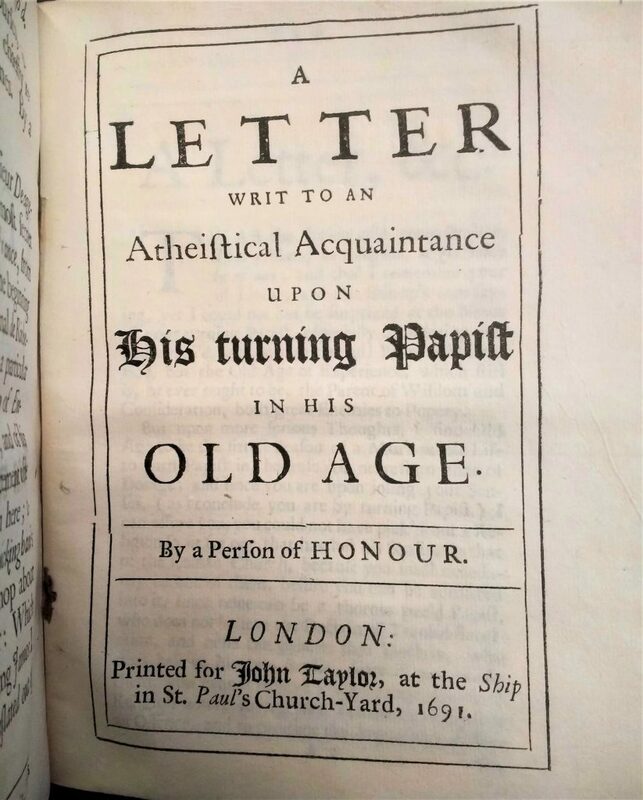 Indeed, as an important source of paper – a relatively luxurious commodity for much of the history of printing – margins have been put to a wide range of more quaint uses; for handwriting practice by readers learning to write, for example, or to record familial births, deaths and marriages. 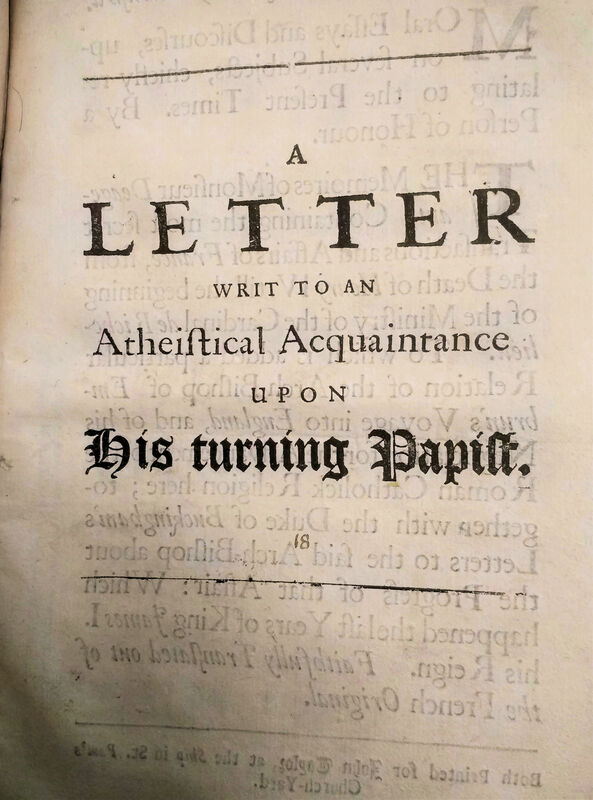 A previous reader has gone to town on the paper offered by front cover of this 17th century pamphlet. Handwriting practice, perhaps? Grafton, Anthony and Lisa Jardine. ““Studied for action”: how Gabriel Harvey read his Livy”. Past & Present, 129 (1990). O’Brien, John. 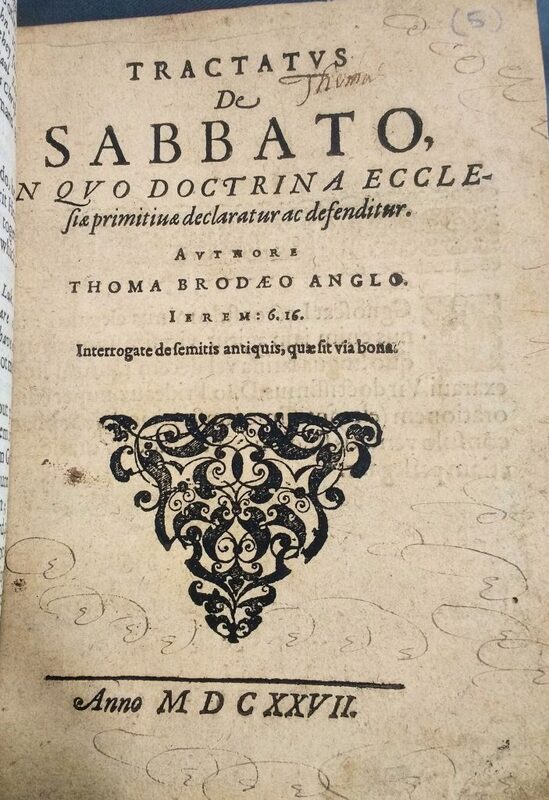 “What Montaigne meant to them: the Essais and their early modern readers”. Annual Bonnier Lecture in French Studies, University of Liverpool (2018). 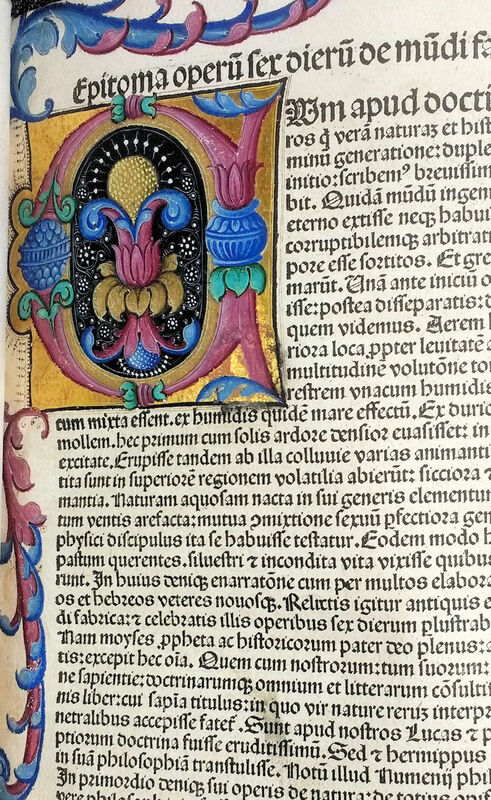 Incunables are books printed with moveable type before 1501. 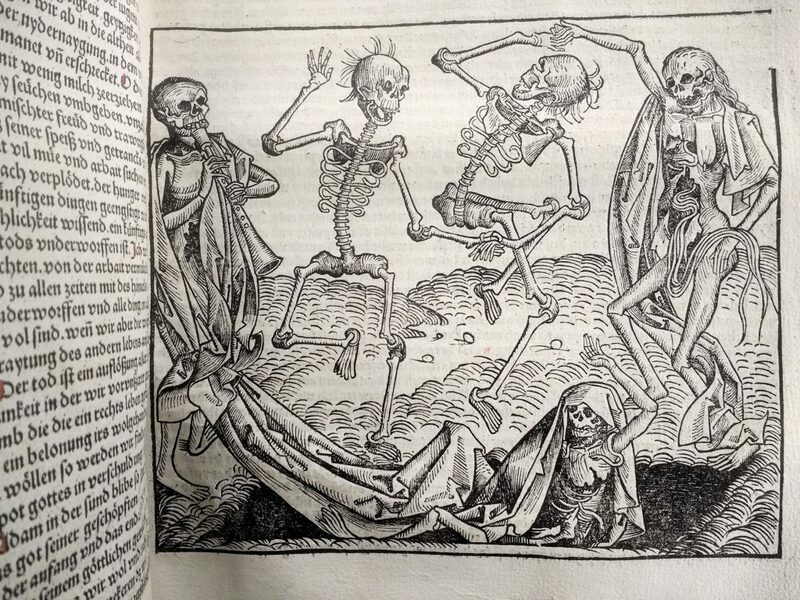 Incunable comes from the Latin incunabula – a fake plural Latin noun derived from in cunabulis (in the swaddling clothes). 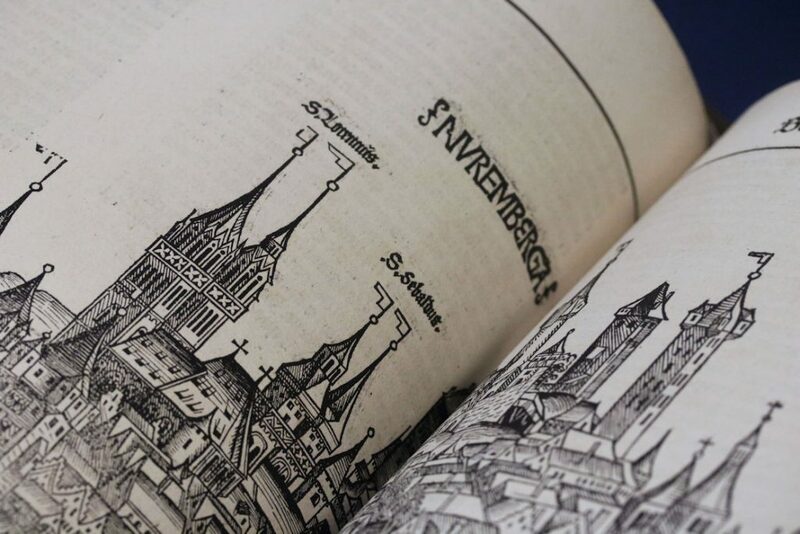 According to S. H. Steinberg’s Five hundred years of printing, the term incunabula was first used in the context of printing at the celebrations of the second centenary of Gutenberg’s invention of the moveable metal type printing press. 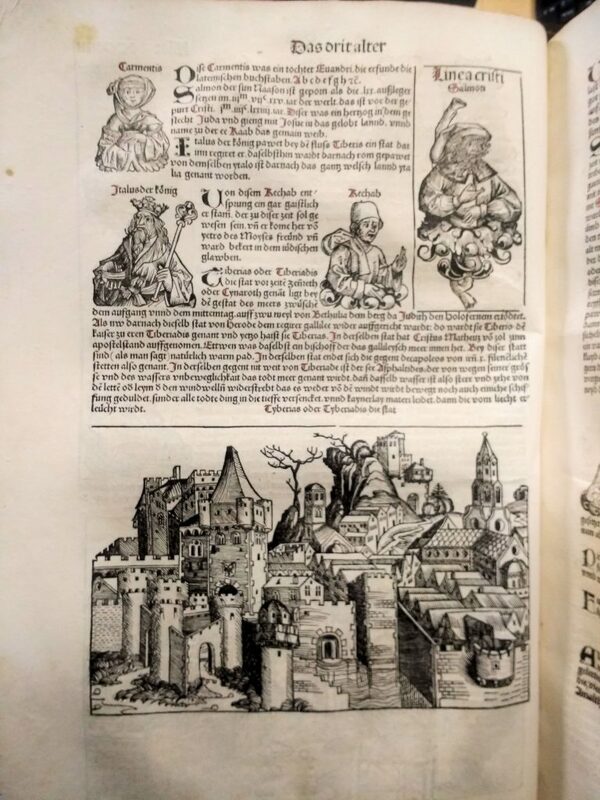 A tract printed in Cologne in 1639 described the later fifteenth century – from Gutenberg to 1500 – as ‘prima typographiae incunabula’, the time when typography was in its swaddling clothes. 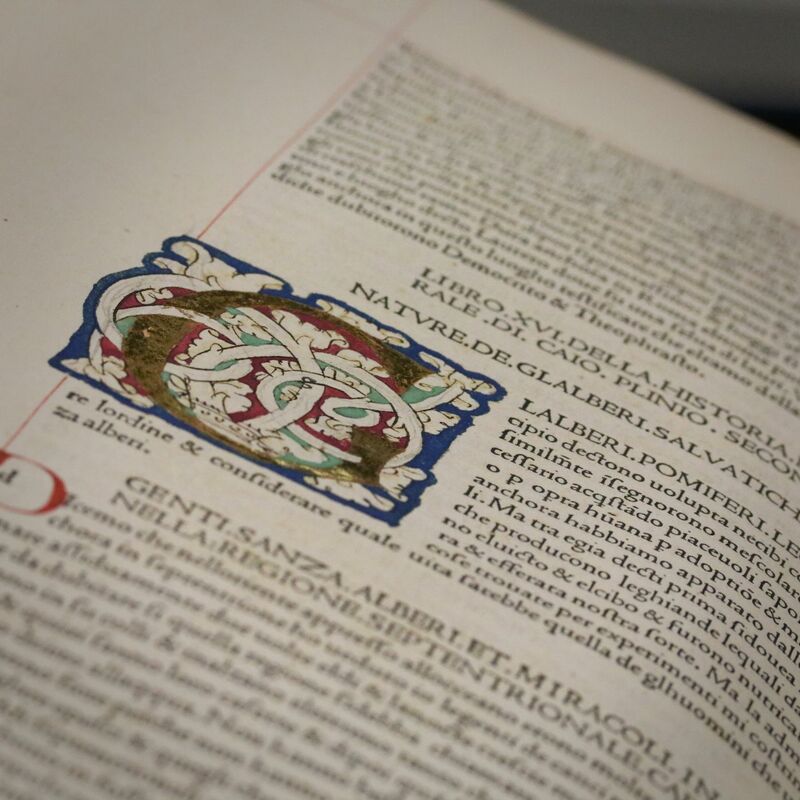 Incunables have many features in common with manuscript books of the same period, and even more with the books printed in the first half of the sixteenth century, but owning incunables retains a particular cachet and many libraries have separately catalogued collections of incunables. 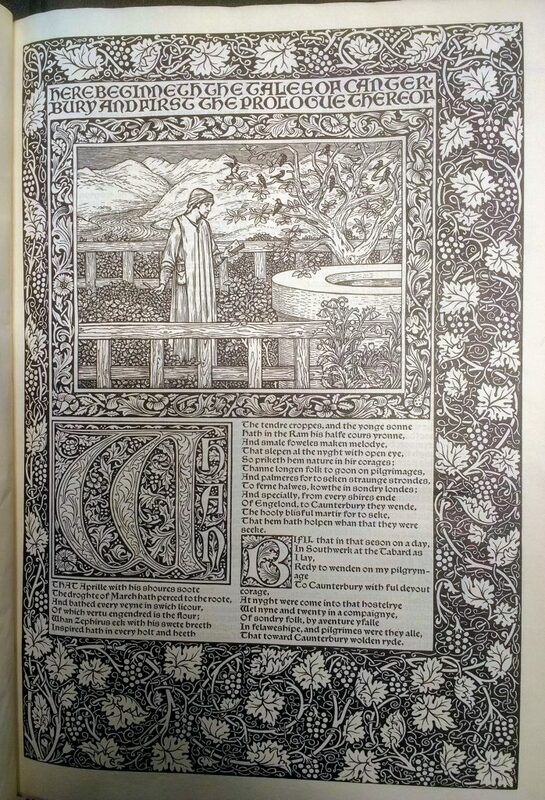 The British Library’s Incunabula Short Title Catalogue (ISTC) is an international database of European fifteenth century printing listing more than 30,500 editions and library catalogues of incunables will often cite the ISTC number. Other major online catalogues include Germany’s Bavarian State Library Bayerische Staatsbibliothek Inkunabelkatalog and Oxford’s Bodleian Library Bod-Inc Online. 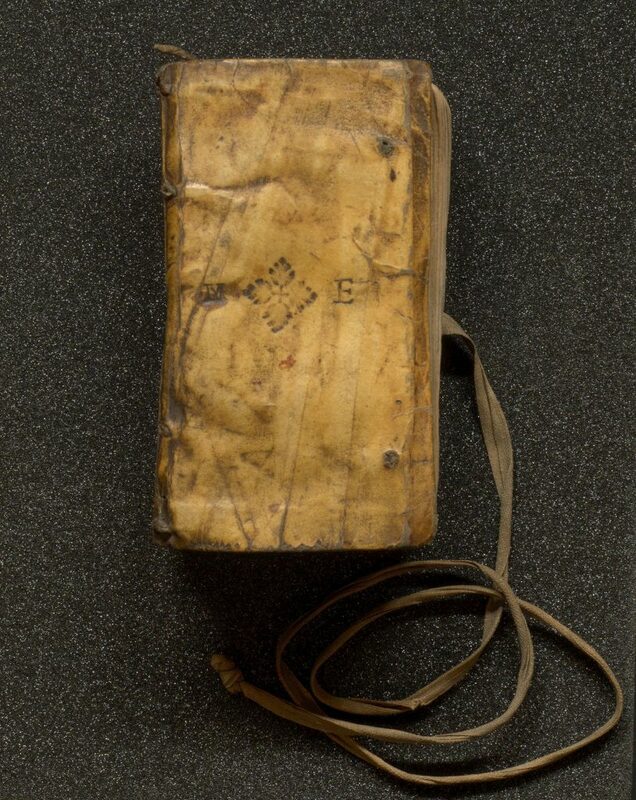 The ongoing Material Evidence in Incunabula (MEI) project links ISTC records with details of individual copies to uncover the journeys they have made over the centuries. 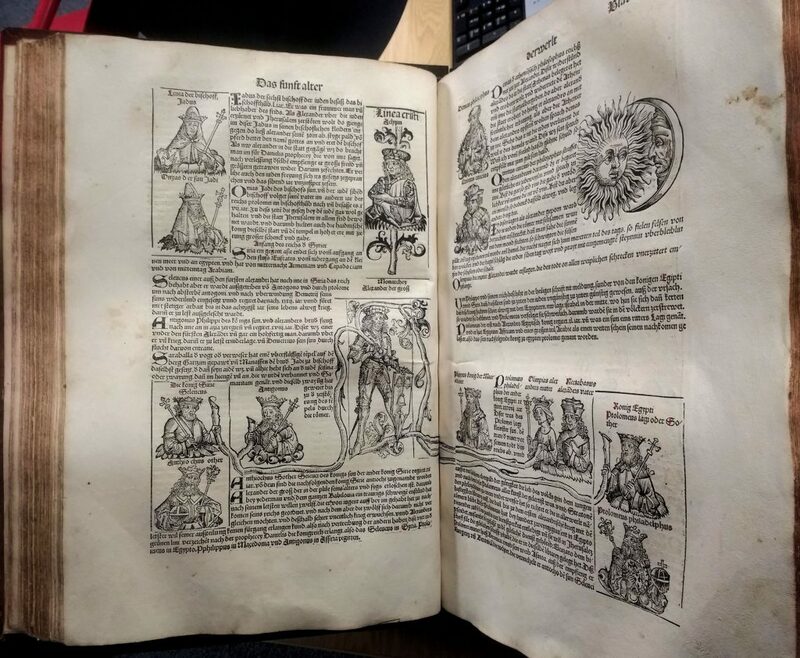 Liverpool University Library has more than 250 incunable volumes, thanks chiefly to the fortunate coincidence of a revived interest in the medieval period in the late nineteenth century, when the University of Liverpool was founded with the support of many Liverpool benefactors. 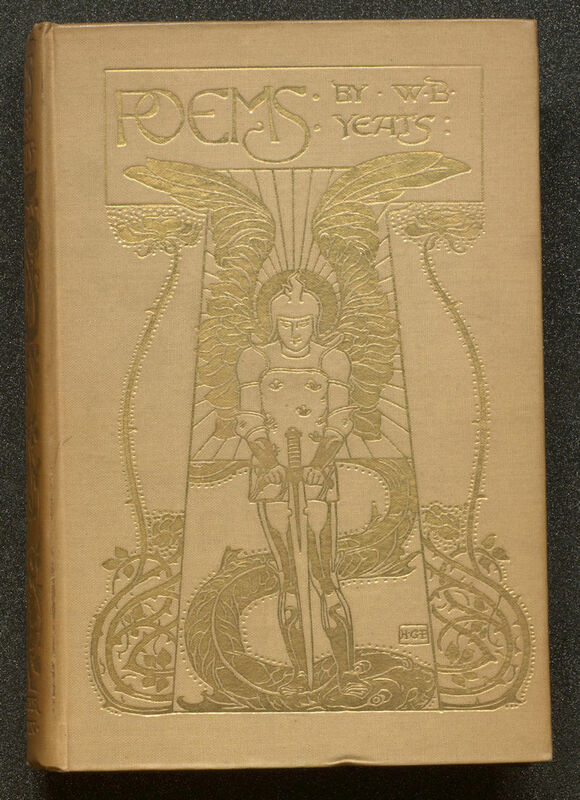 Further reading: S. H. Steinberg, Five hundred years of printing first edition 1955, 1996 British Library. 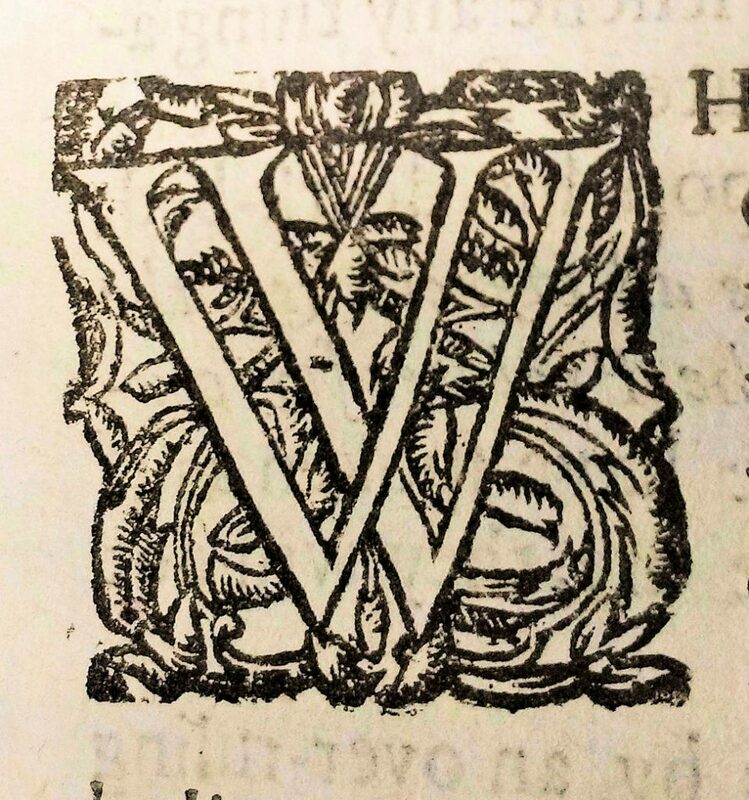 A half-title is a leaf that directly precedes the title-page proper and contains a title or short title, and perhaps the name of the author, or a volume number. Half-title page for a pamphlet of 1691. 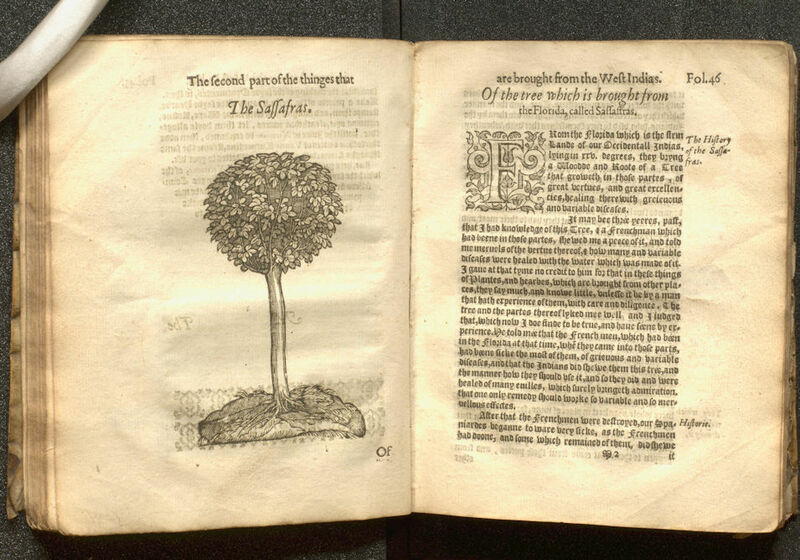 Given that the details recorded on a half-title are generally repeated, and elaborated upon, on the title-page which follows it, one might well wonder what purpose this extra leaf serves. 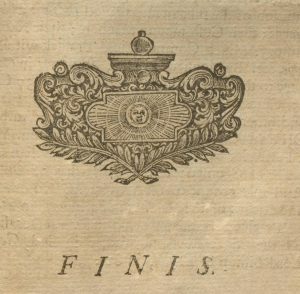 The title-page of the same pamphlet, which directly follows the half-title page shown above. 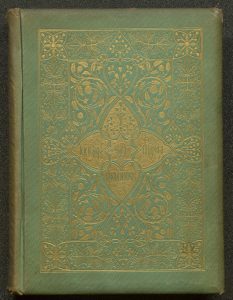 A favoured explanation* takes as its starting point the fact that, in the early printed book trade, the printing of the book and the binding of the book were two quite separate activities. Initially, printers would produce the pages of a text – the text-block – which they sold unbound. The text-block’s new owner would then have these pages bound into a volume according to their tastes and budget (or, in the case of a bookseller, the taste and budget of the customer they hoped to attract). To help protect the first page of the text-block from dirt and dust, it was customary for early printers to put a blank sheet on top of the unbound text-block. 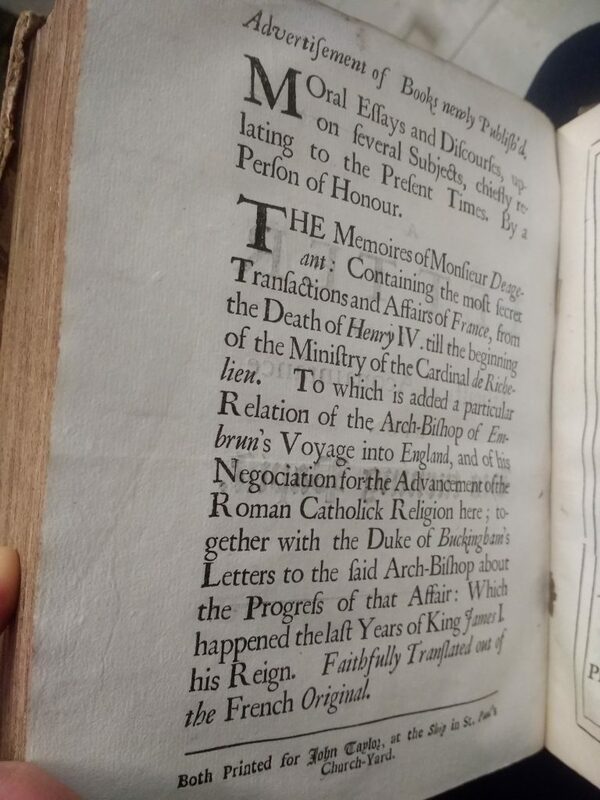 Here it should also be noted that the very earliest printed books did not contain a title-page. The blank sheet, originally intended for protection, came to be marked with a ‘title’, then, in order to help printers to quickly differentiate one text-block from another. 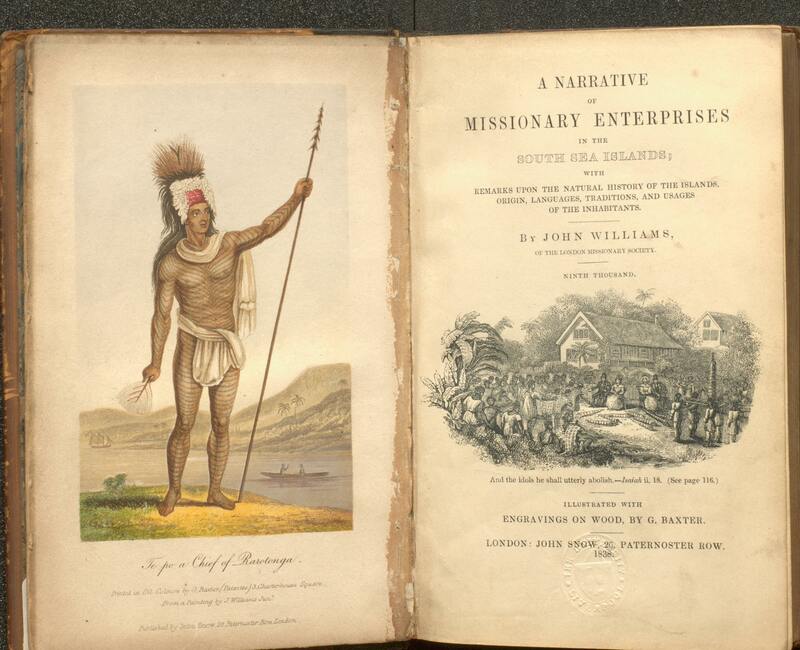 From here, this added sheet developed into the full title-page as we have come to know it; with publication details, and perhaps even some illustration, as well as author and title added to it. But as this page became increasingly important in its own right, it became necessary to protect it from dirt and dust too, and so the process was repeated. A blank page, laid on top of the title-page to protect it from dirt and dust, had a short version of the title added to it to help with identification in increasingly busy printing houses and binderies, during the second half of the 17th century. It is worth noting that there was arguably little clear impetus for this half-title leaf to be retained in the finished, bound version. Indeed, according to John Carter’s ABC for Book Collectors, binders removed these sheets more often than not – not just because they were inessential, but because waste paper of this sort could be sold back to the paper mills, creating an extra mode of income for bookbinders. 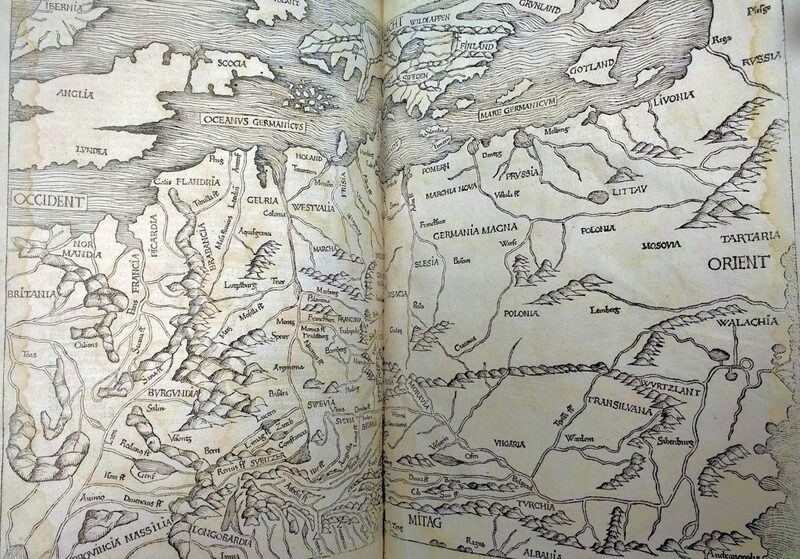 This helps to explain why half-titles aren’t more common in early printed books. *This is the explanation provided by Philip Gaskell, in his renowned A new introduction to bibliography, for instance. 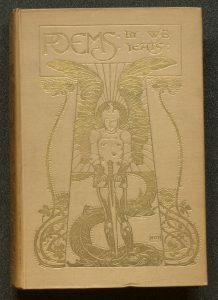 Gilt and gold-tooled (or tooled in gold) are terms used to describe the techniques of applying gold decoration to a book’s page edges and its binding. In gold-tooling, individual engraved metal hand tools are heated and applied through gold leaf to impress the design on the book’s spine and covers. Larger designs use an engraved metal block in a blocking or arming press, for example a centrepiece block or corner blocks.The design is then described as blocked in gold rather than tooled in gold. 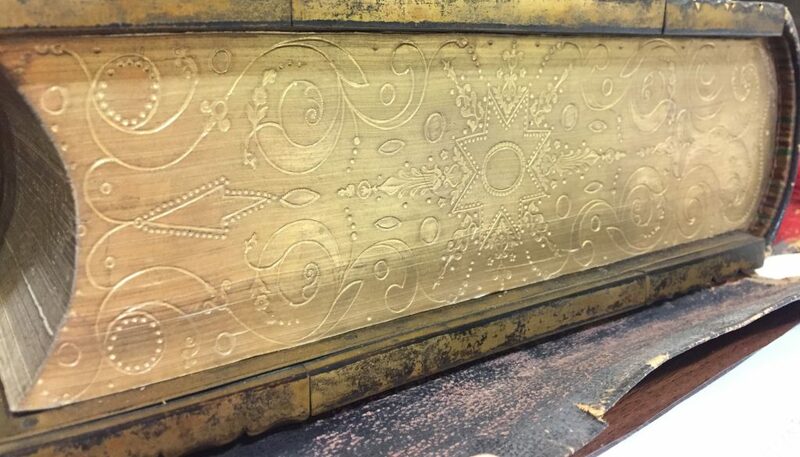 If the binder’s tools or blocks are used straight onto the bookbinding material the decoration is described as blind-tooled (tooled in blind), or blocked in blind. 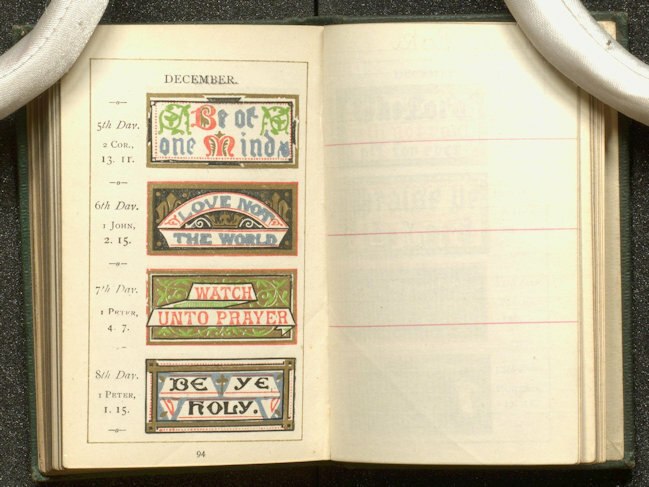 A panel-stamp is a single large block used to impress a design onto the book cover; the term is used particularly of ‘blind-stamped’ 16th-century bindings, but the pretty cover designs of 19th-century literary annuals or gift books use essentially the same technique. Whether the material is leather, vellum, or cloth, and the design is tooled or blocked, these techniques have produced some of the most stunning bookbindings from all periods. 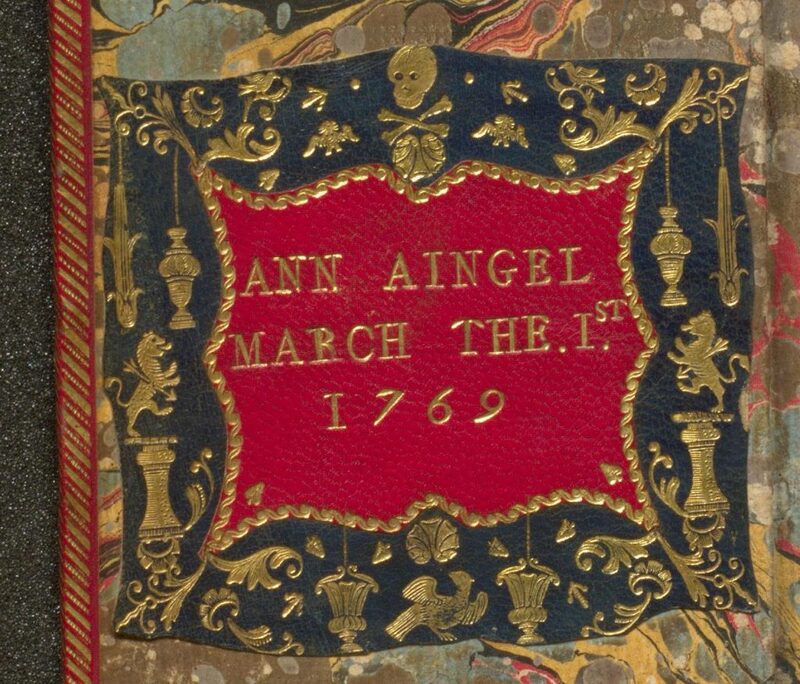 Two 18th centiry religious works in a red morocco binding of ‘cottage’ design, inlaid with black, with the leather book-label of Ann Aingel, 1769. Gilding describes the process of applying gold leaf or gold powder to the trimmed edges of the pages of a book. As well as giving the volume a more luxurious appearance, the smooth shiny surface serves the practical function of resisting dust. Gilt edges may be made more ornate by tooling a design onto the gilded surface, to produce gauffered edges. 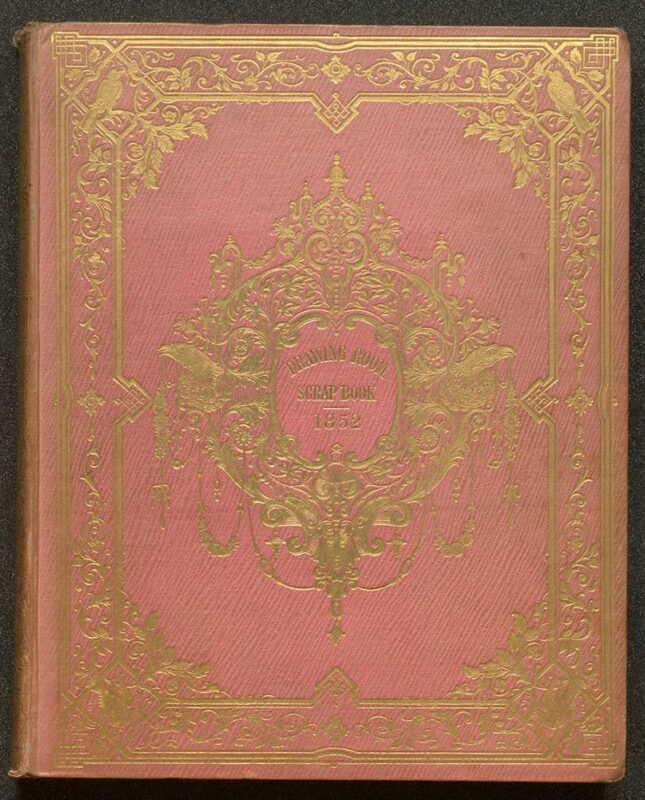 Bible ( 1831). 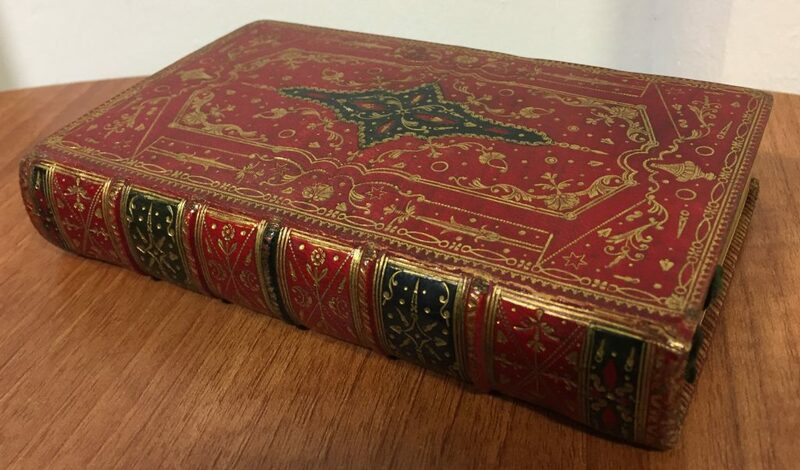 In a very elaborate Victorian leather binding; all edges gilt and gauffered. The Language of Bindings glossary at Ligatus. Printing in the hand-press period was time-consuming, involving the setting-up or composition of sheets to be printed from individual pieces of type. As a printer’s stock of type and printing presses was limited, the type would be redistributed once the sheets had been printed. Watch a demonstration of the printing process on the website of the Victoria & Albert Museum (© Victoria and Albert Museum, London). 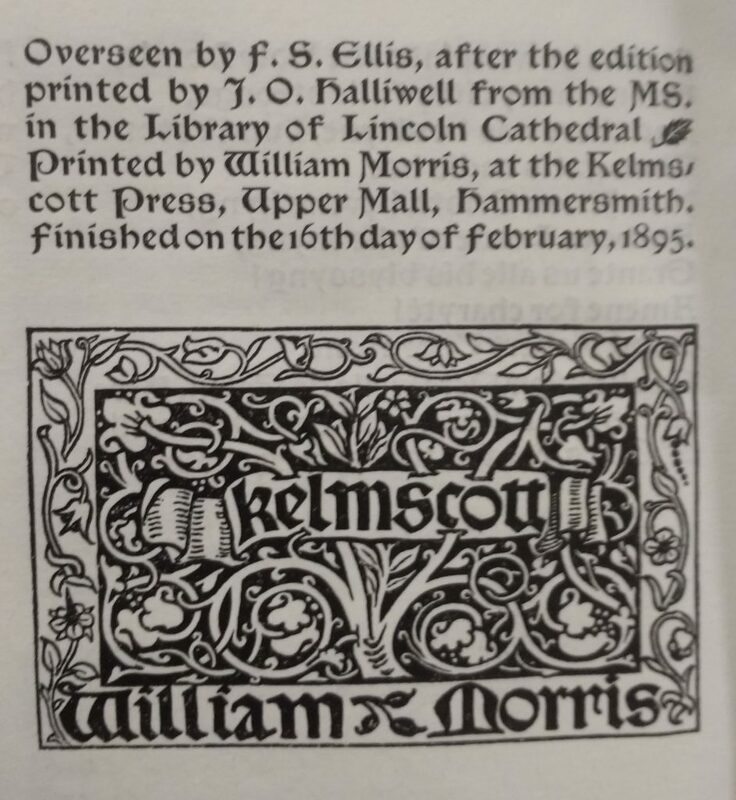 The copies of books printed at any time from substantially the same setting of type constitute a single edition; if more than half the type is reset, there is a new edition (citing Philip Gaskell A New Introduction to Bibliography, Oak Knoll Press 2012). 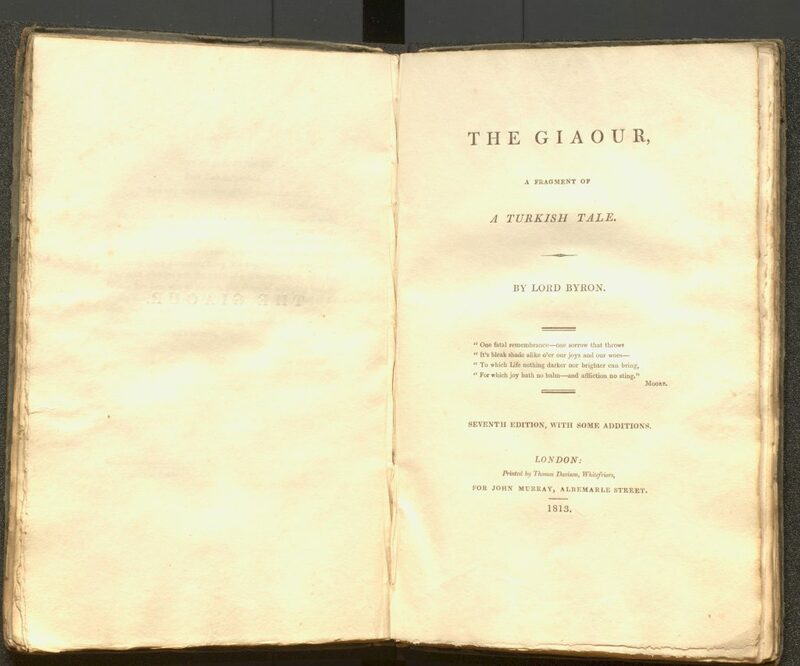 Subsequent editions might follow in rapid succession in the case of popular works, such as Byron’s The Giaour (1813) which appeared in eight editions in its first year. Parts of an edition might be printed more cheaply, or more expensively, using different paper, to produce a subset for a particular market such as cheap copies for export or copies on higher quality paper (with a price to match) to appeal to collectors. 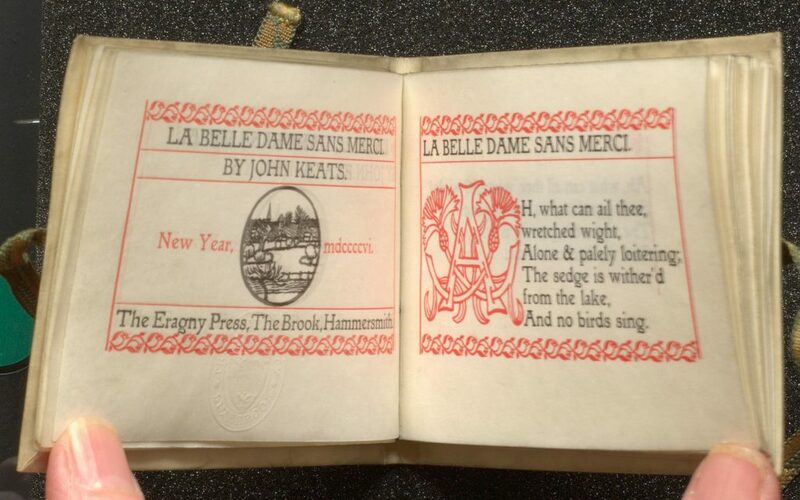 Books produced in a limited edition will have a statement declaring how many copies have been printed and each copy will usually be numbered, often as part of a subset of greater of lesser rarity. 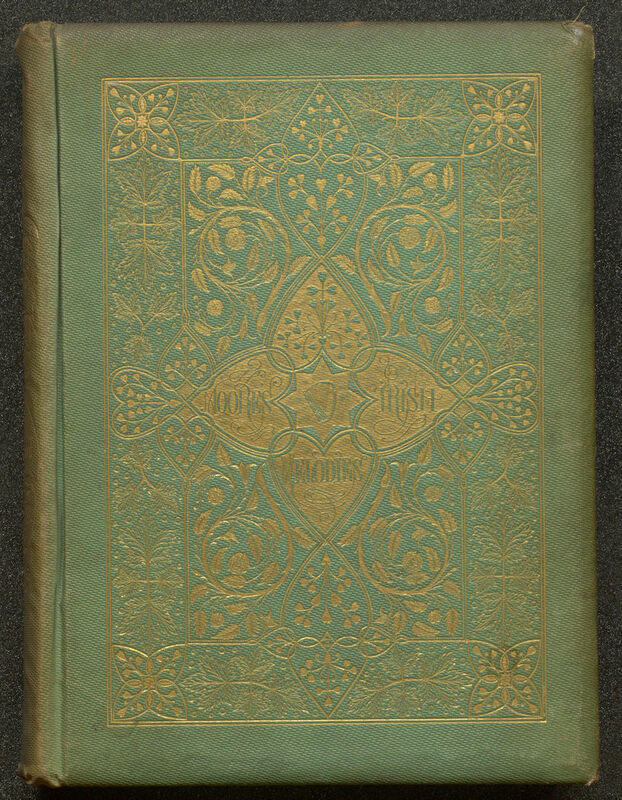 The Ashendene Press edition of Thomas More’s Utopia (1906), for example, included 20 copies printed on vellum. 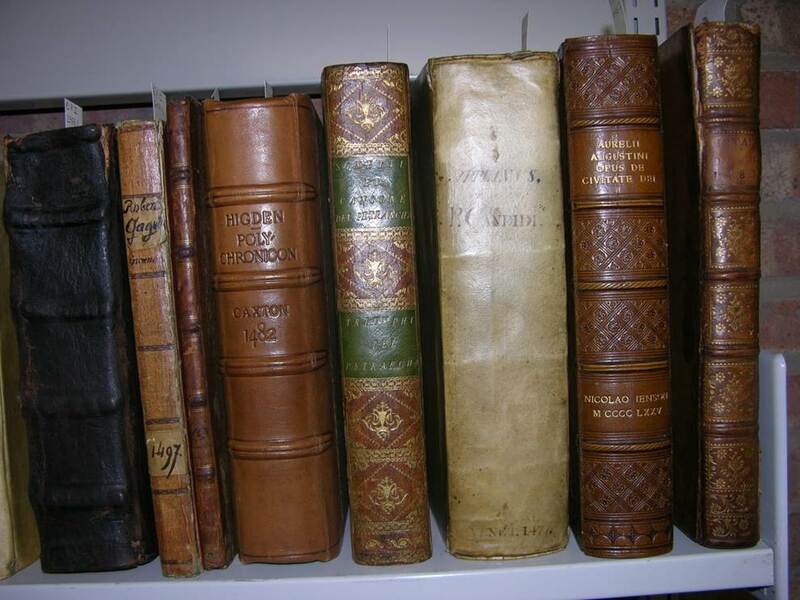 Special Collection’s copy collected by William Noble (SPEC Noble A.20.1) is printed on vellum but unnumbered. 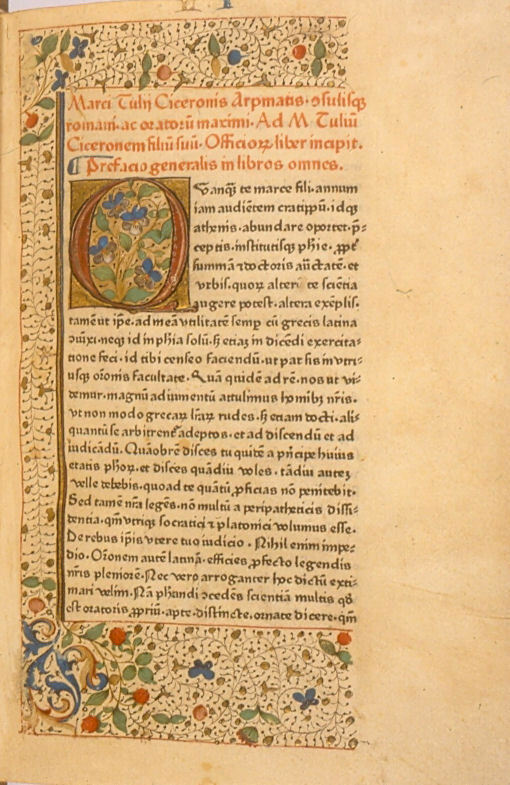 Editio princeps, the Latin for first edition (‘princeps’ also conveys the sense of a distinguished leader in the field) is often used to refer to the first printed edition (as opposed to manuscript) of a classical text, for example the edition of Cicero printed in Mainz in 1465. A ‘printer’s device’ (also known as a printer’s mark or emblem) is a form of trademark, used widely by early printers from the 15th to the end of the 17th century. Devices were initially employed primarily as a means of differentiating a printer’s work from forgeries and imitations. However, they soon came to be seen, in addition, as a marker of quality, familiarity, and style. In effect then, they represented an early form of logo; a marketing tool and security device. 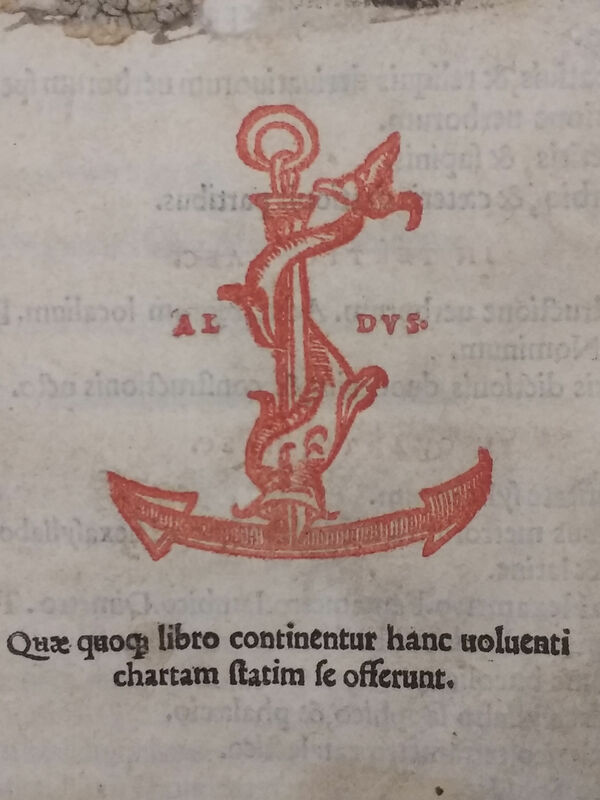 One of the most instantly recognisable printer’s devices is the dolphin and anchor of the important, innovative Venetian printer Aldus Manutius (this book (EP.B08) was printed in 1523). Devices are most often found directly above or below the imprint (publication details such as name of printer, and place and date of printing). 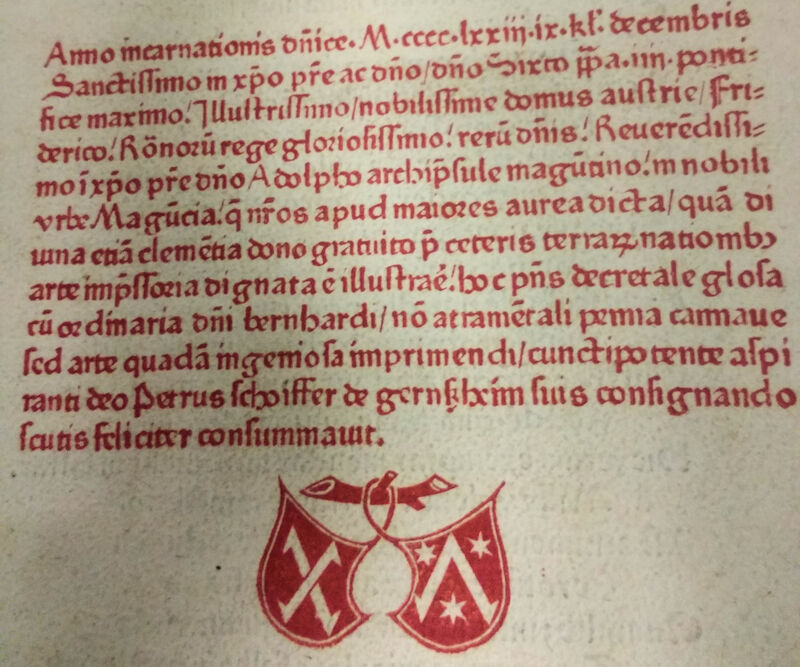 As very early books were printed without a title-page, it is not uncommon to find these details at the end of the main text, in what is called a colophon, particularly in books printed before 1500. This is the device of the famous printing partnership of Johann Fust and Peter Schoeffer, printed beneath the colophon in a book of 1473 (Inc.JWH.7/OS). Fust and Schoeffer, who were responsible for printing the Mainz Psalter of 1457, are credited with being the first printers to use a device. For more information on printer’s devices see “Printer’s marks” by W. Roberts.